Would you like a keepsake from the legendary Cryptsy disaster? A collectible to show the grandchildren in 20 years? On the flashdrive we received from the receiver were 2 Dogecoin wallets of enormous size. Both wallets are over 3 GB in file size! These wallets have remained uninspected and unsynced since their arrival. I don't imagine these wallets contain any coins. They were almost certainly emptied either before or after the receiver took control. But we don't have the time currently to check. Because of their size, these wallets will be unusable under Windows QT. Most likely the new owners will need to use Linux daemons to view their contents. I searched for a contest plugin for SMF but didn't find anything appealing. So in a few words below, simply explain why you would like one of these 2 wallets. Then on April 23rd, I'll close submissions and make a poll so the community can pick the 2 winners. The wallet.dat files will be delivered via password-protected Dropbox links. Simply put, over time these wallets should contain some value. 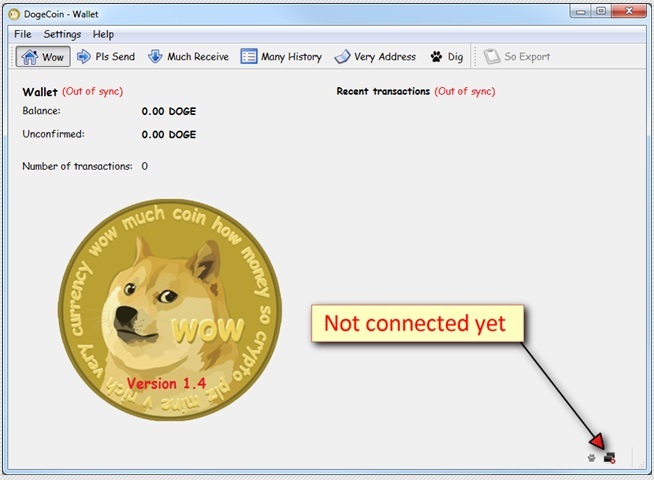 I have the means to create a DOGE wallet in Linux and the space to hold the wallets indefinitely. If any coins move to these wallets and are not periodically checked, whatever coins were moved would be lost to the economy. Since these were heavily used they should at the very least remain maintained by a responsible person or coins could be lost forever. I would be very happy to have one or both! That's pretty interesting. I bet the wallets do contain coins. Most likely some unclaimed CLAM coins as well, depending on how many active addresses there were on the checkpoint day in May 2014. Some people might have fire and forget miners that they had pointed at their Cryptsy account deposit address, or other automated services that continued to run. I was linked here from /r/dogecoin where I am a moderator (/u/peoplma), I'll do my best to distribute anything that's left back to the community as I had no personal losses in Cryptsy. i'm very confident they are empty, they are so large as not to be the offline wallets, ie so large because so many inputs and output to cryptsy hot wallets. funds where transferred to one wallet then dumped on the exchanges along with other major coins (btc/ltc etc). other assorted coins still had coins as they only mainly dumped the ones with enough liquidity. in the days/weeks/months before cryptsy left town i was warning everyone about the bitcoin as i traced their wallets to being dumped. mods banned me for doing so. i was told by horus for example when i asked for where the funds went, "thats private information" i explained how that was not the case as bitcoin is an open ledge (i was merely asking for information that i already new to see where mods stood). horus since has apologised to me openly saying i was right all the time and that he was just in denial. so why do i want empty doge wallet? i want them to confirm what many of us already know however they are simply another piece in the jigsaw. 1. I cracked the MaxCoin wallet of 4.3 GB which had a sum total in coins with the equivalent value of 0.96 USD. 2. I took the Nyancoin wallet of much smaller size, but restored all the coins to a Nyancoin Community Leader, instead of crashing their market on Cryptopia. Wallet request submissions are now closed. I'll get the poll started the first thing in the morning! Congratulations to our contest winners Stouse49 and Doge_Man. I'll be creating password-protected Dropbox links and sending them via PM within the hour. yes a newbie with 2 posts (Doge_Man) simply asking for doge wallet wins i thought only geniune devs or geniune goldcoin community members where eligible? (not bad sportpersonship, as stated in pm any wallets i check i happily donate to goldcoin fund, tis what i feel should have been done with any coins geniune devs can't be found for, also the dogecoin wallets are very likely empty and of no use to people just wanting coins). i personally still would like the wallets after people have used them as mentioned for the original reason i was claiming them. if you find coins you can move them before i get the wallets. Just a thought but it might be interesting to have regular drawings and prizes of GoldCoin to new and active community members if we still have any community GoldCoin flows. Just an idea. Since it'd be a giveaway, it could be posted on social networks along with explaining what GoldCoin is and how to get involved. Anyhow, this has been kind of exciting. Yes, we have a community. Get involved with Cryptocurrency! Learn how it works. Special drawing of 100 GoldCoins. Register at gldtalk.org to get your free chance at winning. Drawing occurs at midnight on Saturday. Have fun, learn how cryto works and get a shot at winning 100 GoldCoins for free! Tell em' Grumpy Old Man Tad sent you. This is a Great idea! I'll get this drawing started tomorrow after our team meeting. Thanks. I will report the results of my findings in the wallet for balance, distrubution and kelsey can have the wallet after I am done with any reports I can generate using 'listtransactions', etc.